The Debtor, based in New York City, is an oil and gas exploration and production company. 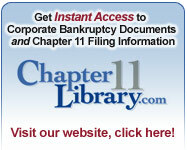 Learn about new oil/gas Chapter 11s fast. Sign up for our daily Chapter 11 list now!